Episode #22: Superman Vs. Superman! While looking at the web site www.supermanhomepage.com/news.php, on the left hand side of the site was a list of dates special to Superman's history for this particular month. One of them was June 10, 1986. That was the date that MAN OF STEEL #1, John Byrne's mini-series that began the relaunch of Superman, was first published. I thought devoting an episode to the differences between the two versions of Superman wold be a good topic. I also plug the video podcast SPEEDING BULLETINS, where the hosts went to the resent 30th SUPERMAN CELEBRATION at Metropolis, Illinois. They also host the podcast SUPERMAN HOMEPAGE: RADIO K-A-L. Expanded show notes can be found at http://supermanfanpodcast.blogspot.com . Send e-mail to supermanfanpodcast@gmail.com . Episode #20: Jerry Siegel's Other Artists! Jerry Siegel co-created several characters that were originally drawn by comic book artists other than Joe Shuster. They were: THE SPECTRE with Bernard Bailey, THE STAR SPANGLED KID with Hal Sherman, RED, WHITE & BLUE with William Smith, ROBOTMAN with Leo Nowak and Paul Cassidy from his Cleveland Studio. A great web site to see photos of the late Leo Nowak and samples of his art is http://entertainment.webshots.com/album/539155811UMfZaW . Episode #19: Happy Father's Day, Jonathan Kent! 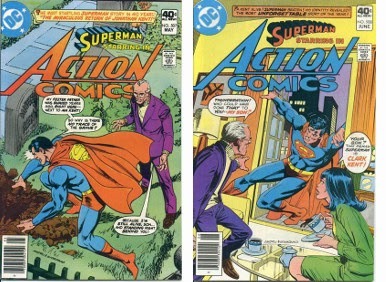 Action Comics 507 & 508! On this first Father's Day for the Superman Fan Podcast I knew I had to feature a special two-part story: THE MIRACULOUS RETURN OF JONATHAN KENT! from ACTION COMICS #'s 507 & 508, May - June 1980 This episode is full of **SPOILERS**, so if you would like to read this story first, it has been reprinted in the DC Comics trade paperback SUPERMAN IN THE EIGHTIES. Episode #18: The Mystery Of The Superman Sketch! A woman finds a Superman sketch at her mother's home. It is autographed to her father and signed by Jerry Siegel and Joe Shuster. How did her father receive the sketch; and are the signatures authentic? This was a segment of an episode on the PBS series HISTORY DETECTIVES. It appeared during its fourth season on episode 11. To view a transcript of this episode for yourself go to: http://www-tc.pbs.org/opb/historydetectives/pdf/411_superman.pdf . Episode #17: The Siegel And Shuster Cleveland Studio! In this episode I feature the artists who helped Joe Shuster produce the many Superman stories and the Superman comic strip until the late 1940's, when Siegel and Shuster were fired by DC Comics. MY PULL LIST is my spoiler free comic book review blog of the titles I read every week. It can be found at http://mypulllist.blogspot.com . Send e-mail about this blog to supermanfanpodcast@gmail.com .